This article is about the area of London. For other uses, see Brockley (disambiguation). 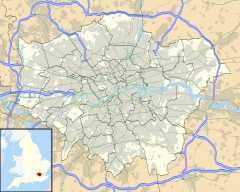 Brockley is a district and an electoral ward of south London, England, in the London Borough of Lewisham 5 miles (8 km) south-east of Charing Cross. The name Brockley is derived from "Broca's woodland clearing", a wood where badgers are seen (broc is the Old English for badger) or Brook (Stream) by a wood (Ley). Formerly part of the county of Kent, Brockley become a part of the Metropolitan Borough of Deptford in the County of London in 1889, and subsequently was brought into the London Borough of Lewisham with the creation of Greater London in 1965. Brockley has its origins in a small agricultural hamlet of the same name located in the area of the "Brockley Jack" (rebuilt 1895), a large Victorian public house that today houses the Brockley Jack Theatre. Brockley Hall (demolished 1931) stood nearby and now gives its name to a road on a 1930s housing estate. Crofton Park railway station was built nearby in 1892 by the London, Chatham and Dover Railway. Situated just west to what is now the Brockley conservation area, Brockley railway station was opened on 6 March 1871 and is currently served by London Overground and Southern in Travelcard Zone 2. As is often the case in London, the location of the station defines the geography of the district and areas to the north and west of Brockley Station, previously considered as Hatcham, New Cross, Telegraph Hill (SE14) and St Johns (SE8), are now considered Brockley. Ordnance survey maps of Brockley up to the 1940s tend to centre on the location of the Jack, the Hall, and Crofton Park railway station, but recent maps are now more centred on Brockley Station and nearby areas, such as with the electoral ward map demarcating Brockley. While the name Crofton Park was invented by the railway company, it was given official sanction with the naming of Crofton Park Library, a fine arts and crafts building, in 1905, and is now the name of an electoral ward to the south. The oldest surviving house in the area of what is now considered to be the northern extent of Brockley is the "Stone House" on Lewisham Way (opposite LeSoCo) built in 1773 by the architect George Gibson the Younger. This was historically considered to be in Deptford. Brockley market gardens were famous for their enormous Victoria rhubarb which were fertilised by 'night soil' from London. There were orchards too and some ancient fruit trees survive in local gardens. Until the late 19th century a small river flowed northward from Crofton Park and east of Malpas Rd to join the River Thames via Deptford Creek. It is now covered over. Industrial development arrived in 1809 in the form of the Croydon Canal running from Croydon to Bermondsey. This was later filled in and replaced by the London & Croydon railway which runs through the original canal cutting between Brockley (opened in 1871) and New Cross Gate stations. Some of the oldest houses in Brockley are the cottages and shops which form a small terrace on Coulgate Street, just east of Brockley station. These are believed to date from 1833 and were probably originally associated with the canal. From 1872 until 1917, Brockley Lane railway station provided access to the Greenwich Park branch line and the remains of the old station entrance are still visible at Brockley Cross. In the latter half of the nineteenth century, the Tyrwhitt-Drake family developed the north side of Brockley with grand villas, large terraces and semi-detached houses (Tyrwhitt Road and Drake Road are named after the family). Development started south of Lewisham Way in the late 1840s with the modest cottages at 2-22 Upper Brockley Rd and spread south and east towards Hilly Fields. In 1900 Chalsey Rd was the last road to be completed within the current conservation area. However, open farmland remained south of Brockley Grove and west of the railway line into the early 1930s. Many grand houses in Brockley were occupied by the owners and managers of factories in neighbouring industrial areas such as Deptford and Bermondsey. At 63 Breakspears Road lived Edwin Watts, owner of 'ER Watts and Son', a mathematical instrument making company in Camberwell Road. Charles Booth's Map of London Poverty (1900) describes the residents of Wickham Road and Breakspears Road as "well-to-do" or "wealthy". The actress Lillie Langtry was one notable resident during this period. The terraced streets west of Brockley Rd were more mixed: "comfortable and poor". The artist/poet David Jones, whose father was a printer, grew up in Howson Road. Some of David Jones's paintings and illustrations depict his parents' house and garden. The writer Henry Williamson, the son of a bank clerk, was born in nearby Braxfield Road. Brockley contains several fine churches: St Mary Magdalen's RC Church, Howson Road (completed in 1901), St Peter's, Wickham Rd (completed 1870), the Grade II listed St Andrews, Brockley Rd (1882) - originally a Presbyterian Church, which contains the modern stained glass New Cross Fire memorial window (2002) - and the Grade II listed St Hilda's, Crofton Park 1908. The latter was designed by J E Newberry in the Arts and Crafts movement style and still contains its original interior. After World War I Brockley began to lose its exclusivity as the wealthy began to relocate to the outer suburbs and the big houses were increasingly sub-divided into multiple occupation. The typical inter-war houses on Upper Brockley Gardens and on Harefield Rd are clearly more modest than their Victorian neighbours. Small industrial workshops also became established in the mews behind the large houses. The Grade II listed Rivoli Ballroom (originally a cinema) dates from 1913 but was remodeled as a dance hall in 1951. It has a unique and outstanding interior, which has featured in many films, videos and fashion shoots. In 2007 The White Stripes rock band played a secret gig here. Other notable live performances include those by Florence + the Machine (2009, 2012) and Damon Albarn (2014). The building has recently been listed (2007) and is now protected from demolition. Being under the bomber flight path to the London docks, the area suffered significant V-2 rocket and other bomb damage in World War II. The post-war blocks of council flats at the south end of Wickham Rd and at the west end of Adelaide Avenue are evidence of this. During the Second World War, an anti-aircraft gun implacement was located on Hilly Fields. After the Second World War, most of the big houses were sub-divided into multiple occupation. In the 1950s and 1960s these houses provided accommodation for the recently arrived African-Caribbean population, many of whom found employment in nearby Deptford. In 1948, five passengers bound for England from Jamaica on the ship Empire Windrush gave Wickham Road as their intended destination on arrival in London. Other migrants came from Turkey, Cyprus, Italy and South Asia (especially Sri Lanka). In the period 1945–60s it was very difficult to get a bank loan to purchase a pre-1914-built property, hence the frequent subdivision of the larger older houses during this period. From the mid-1960s artists (some associated with nearby Goldsmiths College) started to move into the large and at the time neglected houses on Manor Avenue, beginning the process of 'gentrification' which continues today. Much of north Brockley was designated a Conservation Area in 1974 and in the same year the Brockley Society was formed with the aim of preserving and protecting the character of the area. Brockley is today one of the best preserved and most coherent Victorian suburbs in Inner London and contains examples of almost every style of mid- to late 19th century-domestic architecture from vast Gothic Revival piles to modest workmen's cottages. There are also mews behind some of the streets such as Ashby Mews and Wickham Mews. This range of 19th-century architectural styles makes Brockley unusual. The extension of the East London Line, now part of the London Overground network, opened in May 2010. It connects Brockley with North London and is encouraging new residential development around Brockley station. In 2000 the Brockley Cross Action Group was set up with the aim of influencing the regeneration of the Brockley Cross area and has been instrumental in the restoration of Brockley Common and the greening of several other derelict sites. The old West Kent Grammar School (later renamed Brockley County Grammar School), now Prendergast Hilly Fields College, a Grade II listed building, is situated at the top of the hill. The School hall contains the 'Brockley murals'. Dating from 1932-35 by Charles Mahoney, Evelyn Dunbar and other students of the Royal College of Art, they are considered some of the best examples in the country of the Neo-Romantic style and illustrate many local scenes. Close by, a stone circle was erected in 2000 as a millennium project by a group of local artists, which won a Civic Trust Award in 2004. The Hilly Fields Midsummer Fayre has been running for over 30 years and is a much celebrated annual community event. At 160 ft above sea level, Hilly Fields has wide views from Canary Wharf and Shooters Hill to Crystal Palace and the North Downs in Kent. West of the railway between Brockley and New Cross Gate railway stations lies the Brockley Nature Reserve (formerly known as New Cross Gate Cutting Nature Reserve). This ten acre woodland is home to over 30 species of birds including greater spotted woodpecker and sparrowhawk. The reserve is managed by London Wildlife Trust, access (when open) is from the entrance on Vesta Road. Like its neighbour Telegraph Hill, Brockley has a reputation as a focus for the arts in South London. The mid-1960s saw the beginning of a 'bohemian' influx of artists, musicians and alternative types attracted by the neglected and (at the time very cheap) Victorian houses and vast rambling gardens and the close proximity to Goldsmiths College and Camberwell School of Art. Many artists have built studios in their back gardens and the annual 'open studios' weekend is a good opportunity to visit some of these. The Lewisham Art House, housed in a grand Edwardian building (which was formerly Deptford Library) on Lewisham Way, provides art classes, studio and exhibition space. The Grade II listed library building is a Carnegie Library, made possible by the philanthropy of the industrialist Andrew Carnegie. It opened in 1914 and was designed by Sir Alfred Brumwell Thomas. The Brockley Jack Theatre has recently been refurbished and has a high reputation for performances of new plays and is the home of the Brockley Jack Film Club. Each summer local artists host a thriving Brockley Open Studios weekend. Since 2004 Brockley has also hosted the Brockley Max performing arts festival involving many local musicians and singers. In 2015, the neighbourhood hosted the first annual Brockley Street Art Festival, which saw the creation of more than twenty high quality murals in the area. Brockley ward is represented by three Labour councillors as of the 2018 election. All of Brockley Ward's three councillors were from the Green Party and combined with neighbouring Ladywell ward, Lewisham Council had six Green Party councillors; one of the highest number of Green party councillors in the UK. However, in the 2010 Local Elections, held at the same time as the 2010 General Election, the Green party lost all but one of their seats. The remaining seat was held by Darren Johnson in Brockley. In the 2014 Council elections the Green Party retained one of Brockley's council seats, which is held by Councillor John Coughlin. David Jones, modernist poet and artist; born in Brockley in 1895 and often stayed at his parents' house in Howson Road until his mother's death in 1936; attended Camberwell School of Art in 1909; his parents are buried in Brockley and Ladywell Cemetery where there is also a memorial to him. The June Brides, proto UK indie pop group including singer Phil Wilson; shared a house in Chudleigh Road; viola player Frank Sweeney still lives not far from there. Pagan Altar, metal band who recorded a song entitled "The Devil Came Down to Brockley"
Bobby Valentino, singer, songwriter, musician and actor; has lived in Brockley for the past 30 years; best known as the co-writer and violinist of the Bluebells hit single "Young at Heart"
Bradley Wright-Phillips, professional footballer for Charlton Athletic F.C. The musician Nick Nicely's 1982 cult psychedelic track "Hilly Fields" was inspired by the park of the same name. Two early novels by Henry Williamson (who lived on Eastern Road) describe Brockley in great detail, as it was in the early 1900s. Edgar Wallace's fictional 1920s detective J. G. Reeder lived in Brockley Road. Wallace himself lived in Tressillian Crescent, Brockley, for over 30 years. His book The Duke in the Suburbs is also based in Brockley. The Picturegoers, the first novel by David Lodge, is set in and around a rundown cinema in 1950s Brockley; thinly disguised as 'Brickley'. Blake Morrison's novel South of the River (2007) is set in Brockley. Colin Wilson's book The Outsider (1956) opens with a reference to Brockley. In 2003, the BBC1 documentary Worlds Apart showed two contrasting Brockley families living within yards of each other; one in a small council flat, the other in a large house. The Rivoli Ballroom has featured in numerous films, TV shows and fashion shoots, and was used for the debut album launch for Florence and the Machine. The Metros' song "Last of the Lookers" from their 2008 album More Money Less Grief mentions meeting a girl who is later found out not to be from their native Brockley. ^ "Lewisham Ward population 2011". Neighbourhood Statistics. Office for National Statistics. Retrieved 13 October 2016. ^ "Brockley". Retrieved 1 December 2015. ^ Mills, AD (2010). A Dictionary of London Place Names. Oxford: Oxford University Press. ^ "Brockley Conservation Area". www.lewisham.gov.uk. Retrieved 1 December 2015. ^ "Brockley Ward Map" (PDF). Retrieved 1 December 2015. ^ Historic England (5 July 1950). "Stone House (1193368)". National Heritage List for England. Retrieved 17 October 2012. ^ Good Stuff IT Services (12 March 1973). "Church of St Andrew (presbyterian) - Lewisham - Greater London - England". British Listed Buildings. Retrieved 28 July 2012. ^ Good Stuff IT Services. "Church of St Hilda, Crofton Park - Lewisham - Greater London - England". British Listed Buildings. Retrieved 28 July 2012. ^ Good Stuff IT Services (2 March 1957). "Rivoli Ballroom 346-350 - Lewisham - Greater London - England". British Listed Buildings. Retrieved 28 July 2012. ^ Joan Anim-Addo, The Longest Journey, 1995. ^ Good Stuff IT Services (12 March 1973). "Public Library - Deptford - Greater London - England". British Listed Buildings. Retrieved 28 July 2012. ^ Lewisham Council. "Councillor John Coughlin". Lewisham Council. Archived from the original on 14 October 2016. Retrieved 12 September 2016. ^ "Tim's Top Tables", London Evening Standard, 29 January 2004. ^ Lidia Vianu, Alan Brownjohn and the Desperado Age, LiterNet Publishing House, 2005. ^ Thomson, Graeme. Under the Ivy: The Life & Music of Kate Bush. Omnibus Press, 2010, p. 57. ^ "Royal Academy of Arts Collections - Person". Racollection.org.uk. Retrieved 28 July 2012. ^ "Kerry Ellis - Stars On Stage | LondonTheatre.co.uk". www.londontheatre.co.uk. Retrieved 21 November 2018. ^ a b 60 SECONDS: Gabrielle By ANDREW WILLIAMS - Tuesday, 25 September 2007, Metro, London. ^ Interview with John Galliano by Paula Reed, Grazia Magazine, London, 21 September 2010. ^ "HASH HOUSE HARRIERS - THE ORIGINAL CHAPTER SINCE 1938". motherhash.com. 2005. Retrieved 24 March 2014. ^ 'Just Grim and Bear It', Daily Mail, 18 October 1996. ^ Guardian Film and Music Pages Film & Music: Pop: Beetle mania: Chris Salmon 29 June 2007. ^ "Lewisham Council - Councillors and wards". Lewisham.gov.uk. 28 June 2012. Retrieved 28 July 2012. ^ a b "Archived copy" (PDF). Archived from the original (PDF) on 28 June 2007. Retrieved 7 May 2007. CS1 maint: Archived copy as title (link) Lewisham Government Guide to the Conservation Area 2006. ^ David Lodge, Autobiography 2014. 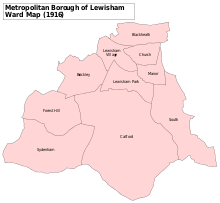 ^ "Lewisham Council - Local history and heritage". Lewisham.gov.uk. 20 October 2010. Retrieved 28 July 2012. ^ "House prices soar on new rail route; East London line opens up 'isolated' areas of the capital". The London Evening Standard. 23 August 2010. p. 12 – via General OneFile. Why live there: The area is not short of green spaces with Blythe Hill, Brockley and Hilly Fields. Who lives there: actor David Haig and musician Nick Nicely. ^ Reynold's Newspaper, Sunday 16 November 1890 issue 2101. ^ Daily News, 17 November 1890, issue 13921. ^ Birmingham Daily Post, 17 November 1890, issue 10109. ^ Harry Price, Biography of a Ghost Hunter by Paul Tabori, Athenaem Press, 1950. ^ a b One on One with Ian Wright by Gavin Glicksman, The Sun, London, 26 February 2011. ^ Jerome, Joseph. Montague Summers: A Memoir. London: Cecil and Amelia Woolf, 1965. ^ "Tarrant: 'I'm humbled by OBE' | Mail Online". Dailymail.co.uk. Retrieved 28 July 2012. ^ Jury, Louise (27 April 2015). "Tempest cover gets gallery slot". The London Evening Standard. p. 31 – via General OneFile. Young people chose the award-winning performance poet [Kate Tempest], 29, who grew up in Brockley, to feature in the gallery's Picture The Poet exhibition. ^ The Electric Bluebirds Sleeve Notes September 1996. ^ Williamson, Anne, Henry Williamson: Tarka and the Last Romantic, Sutton Publishing, 1995. ^ Sam Wallace, "Shaun Wright-Phillips: Size ceases to matter for the Wright stuff", The Independent, London, 1 January 2005. ^ "Florence and the Machine releases new album | InStyle UK". Instyle.co.uk. 10 July 2009. Retrieved 28 July 2012.